I post lots of photos to my Instagram feed and to my Facebook page. If you follow me there, you may already know about my hand sewing project: hexies. I can't believe I have not mentioned this on my blog before now. Naughty me. Way back in June of last year, I started to notice on Instagram that a few people were participating in this sew-along. I was loving the photos, watching for a few weeks when I decided I wanted to join in the fun. Right away I knew I had to use fabric from my stash. 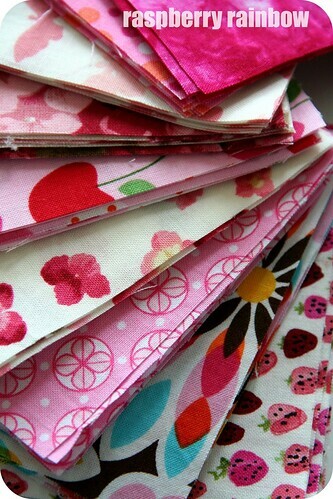 After sorting my fabric, it became very clear to me how many pink fabrics I had, so, pink this quilt would be. Early in July I started to cut up my fabric and on 5th July I basted my very first hexagon. Only a few days later I had made my very first hexie flower. I was hooked. This hexie caper is very addictive. I now take my hand sewing with me everywhere. 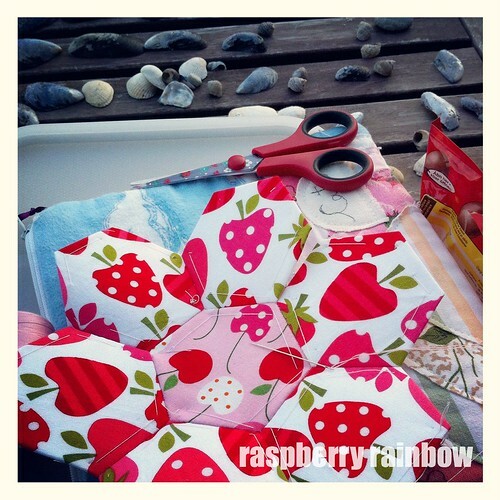 I use the gorgeous Raspberry rainbow zippered pouch that Jennie from My Little Vintage made me. I have made hexies in Hong Kong, Paris, all over Denmark, in London and Shropshire, in Melbourne and even while flying (I don't take scissors, just one sewing needle and many pre-cut threads). After a few months of making hexies, I realised I did not want to make the quilt featured in the quilt-along. I was feeling a bit despondent and not sewing many hexies. Then on Instagram I saw another hexagon quilt, and knew immediately this was how I wanted mine to look (also shown on Carols blog here). I arranged my pink hexie flowers out on the floor, and knew this was it. 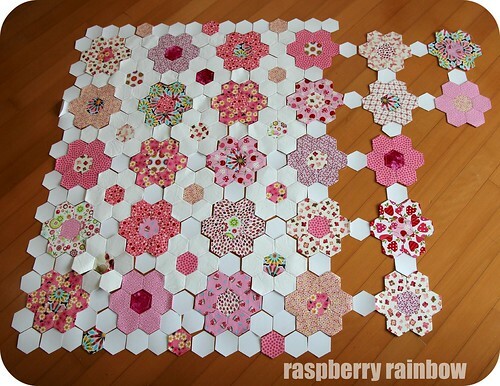 This was how my pink hexie quilt was going to look. 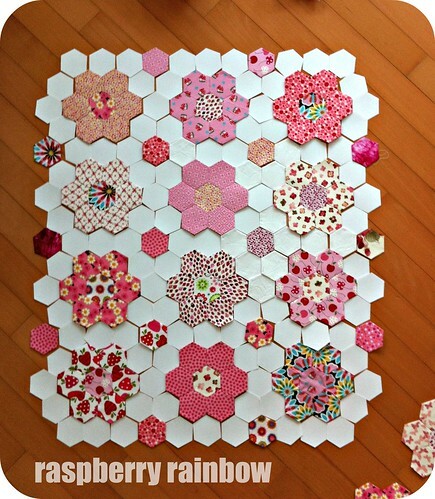 My pink hexie quilt needs white hexies to make all the pink flowers "pop". I still do not know how big it will be be, every few months I lay out all my flowers, and see how much it has grown. I am going to finish this project. It will be a quilt for us. 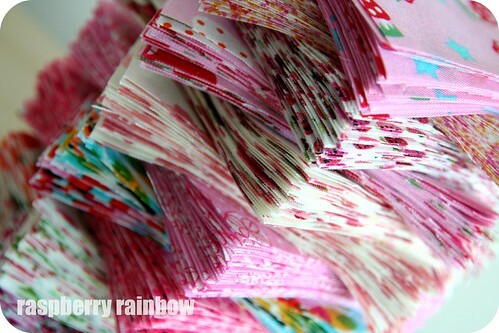 Today, I have 55 finished hexie flowers (yes, another photo is needed). I am still making more. I am still loving this project. There is no hurry to finish it, it will come together in time. If you would like to know more about sewing your own hexies, I have a board on pinterest here, with links to lots of different information. Oh fantastic quilt. I cant wait to see how it looks when it's finished. I've been wanting to start something hexie for a while now. I might just start on a cushion first. I don't know what it is about them but I just love the look of the finihed projects. Wow! I love hexagons but I could never commit to such an undertaking. Well done, your quilt is looking lovely! Oh, I love this. So beautiful and so ambitious. Ohhh its going to be awesome! I love it. I am yet to join the hexy party. oh Cat it looks wonderful!!!! Just found your image and I'm currently doing simila . I've started to join it together, my goal is to have it completed by end of the year. My dilemma is how do I do the backing? Any ideas would be appreciated. My floral hexies are ones I inherited from my Mother who started them in 1960s. I've enough of her hexies to make 3 good sized quilts for my daughters! I still need to sew all these together. I hope to treat the quilt top like any other, and add batting and a fabric quilt backing. I am unsure of the binding and edges though - how will you do your binding/edges?